To me, the Toronto Maple Leafs are the Chicago Cubs of hockey. It’s been ages since they last won a Stanley Cup (only 47 years, not over 100 like the Cubs) and no matter how they try and how great they start out, their season always ends in disaster in one way or another. Last year, when it looked like they would actually do something spectacular, the Boston Bruins came back from a 4-1 deficit in Game 7 and beat them in the Eastern Conference Quarterfinals. 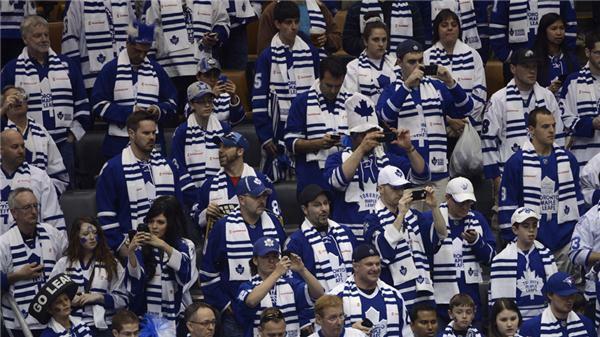 And while we’re on the subject of said series, the scarves the Leafs gave out made Air Canada Centre look like a giant synagogue on some kid’s bar mitzvah. Most of us in hockey fandom just pat the Leafs on their collective head and say “bless your heart, you’re trying” when it comes to actually attempting a thing, so no one really expected them to get past the Bruins. 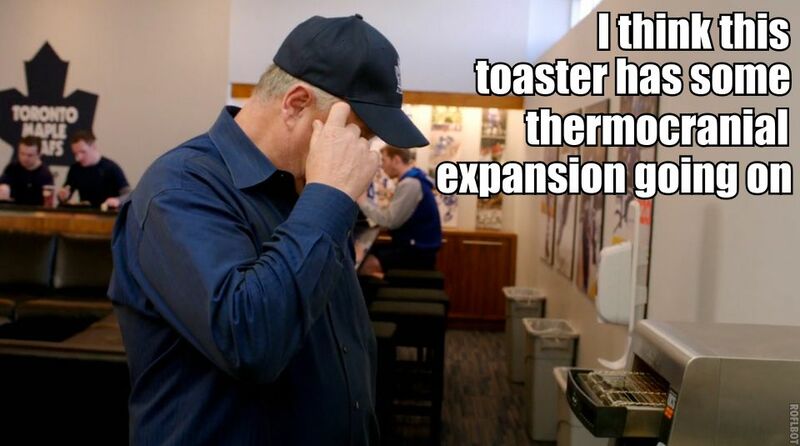 Leafs fans are screaming for GM Dave Nonis and coach Randy Carlyle to be fired. You know Randy, the guy who said Joffrey Lupul‘s concussion was caused by “thermocranial expansion” (helmets retain heat, making the brain swell, and thus it gets injured when you’re hit hard). He has the “heckuva job, Brownie” seal of approval from Dave. Randy’s not going anywhere, Dave says. Well, let’s get rid of Dave so a new guy can get rid of Randy because he’s awful and doesn’t know how to work a toaster (gotta be smarter than the toaster, Randy). Oh hey, here’s Steve Dangle after their 4-2 loss to the Detroit Red Wings. It’s…yeah. I’ve done my share of cry-barfing before with my guys, but it’s getting ridiculous in Toronto. This is worse than Charlie Brown getting duped by Lucy to kick the football. Oh, good grief.